"Best accompaniments with your gifts, these notecards are the best way to convey a thank you, a love message or best wishes to the peope you care about. These notecards are perfect to revive the feel of handwritten messages in this new-age of technology. 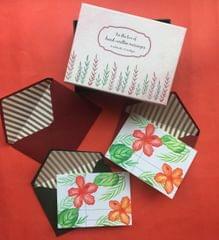 Box of 10 folded notecards with 2 assorted matching envelopes with gold-striped inner liners"
If you pick the personalised option, enter the exact personalisation details you want in the message box. It was be placed as indicated in the image.